Those patiently waiting for Lenovo's Windows 8 tablet can finally place their order for the ThinkPad Tablet 2. The ThinkPad Tablet 2 is on sale now for pre-order through Lenovo's website, with an estimated shipping date of Jan. 8, 2013. It's available in three varieties, starting with the base 64GB model with Wi-Fi priced at $649 (UK£405, AU$634). 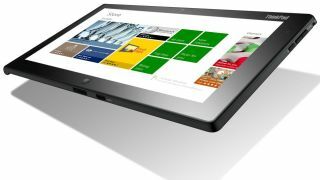 A $679 (UK£417, AU$647) model will add a pen and digitizer, while a $729 (UK£447, AU$695) model will also upgrade the operating system from Windows 8 to Windows 8 Pro. None of the models include the ThinkPad Tablet 2's dock or keyboard. The dock is sold separately as a $99 (UK£69, AU$96) accessory, while the bluetooth keyboard that turns the Tablet 2 into a laptop will cost $119 (UK£74, AU$116). The actual specs for each model will be identical, with a 10.1-inch 1366 x 768 IPS display, 2GB of RAM and a 1.8Ghz Intel Atom processor. The only difference is that the highest end model features 32-bit Windows 8 Pro compared to just 32-bit Windows 8 on the two lower-priced tablets. The early January ship date might not make the ThinkPad Tablet 2 too late for a holiday gift, but for those anxious to get their hands on a tablet running on the full Windows 8, it can't come soon enough.